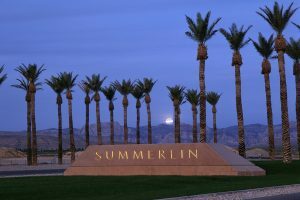 Summerlin, Nevada is an intricately planned community made of gorgeously luxury homes just on the west edge of the great Las Vegas. It is just over nine and a half square miles in size with a population of 24,085 as determined by the United States Census Bureau in 2010. This community is just a stone’s throw away from the beautiful Red Rock Canyon and Spring Mountains which offer spectacular views for those living here. If someone is looking to get out of town, the famous Las Vegas Strip and the Las Vegas International Airport are less than a 30 minute drive away. This makes it very convenient to head out for a night on the town or jump on a plane to travel almost anywhere in the entire world. Instead of traveling the world, just a few minutes from the doorsteps of the houses in this community is the Red Rock Canyon National Conservation Area. The Conservation Area has much available to do for residents and travelers alike. There is mountain biking, rock climbing, horseback riding, many miles of hiking trails as well as picnic areas and a visitor center, just to name a few of the amenities. The uniqueness of the geography, plants and animals of this area brings the best of the Mojave Desert for the public to enjoy. But without even hopping in the car, Summerlin has a lot to offer right outside the residents’ homes. Beside the gorgeous views, this great community boasts approximately 150 miles of trails that connect each of the secondary communities together. This gives a safe and comfortable area to the walkers, joggers and bikers in the area. The community centers plan and host a variety of events throughout the year from classes to workshops and social gatherings, making it easy to get to know one another. Nine of the absolute best golf courses in the world can also be found here. Two of the mare Tournament Players Club courses and are the only two found in the entirety of Nevada. In addition to the wonderful walking trails and the state of the art family-friendly parks, Summerlin has some of the best schools in the country. Thus making this community a great place to raise a family. There are about two dozen schools located in the area which include several nationally-recognized private schools. Besides the great grade schools, there are also two colleges, Roseman University Medical School and College of Southern Nevada, as well as magnet schools and specialized higher education facilities found here. That being said, the United States Census Bureau has found that over 95% of residents hold a high school diploma or greater and almost 50% hold a Bachelor’s degree or higher. This is much higher than the national averages of 86.7% and 29.8% respectively. Summerlin, Nevada is not only a great place to live, but a great place to work and build a life. The median household income is above that of the national average at approximately $89,200 annually, and the poverty rate is below that of the national average at only 6.9%. The downtown area holds many job opportunities from retail to food service as well as a first Class A office buildings home to many companies. Building is still taking place in the area, so more opportunities, from office to entertainment, are going to be available in the near future. That being said, the mean travel time of commuters is only about 25 minutes. This can be partly seen due to the close proximity of Las Vegas and all the job opportunities the powerhouse city has to offer. Buying a home in Summerlin is easy with the healthy housing market. In addition to being able to purchase a brand newly built home, there are gently used options available. The luxury homes in this community have a median home value of approximately $364,700 which has risen 6.2% over the past year and are expected to rise another 4.6% over this coming year. The median listing price in this area is $471,390 with a price of about $204 per square foot. Although over 60% of residents own their homes in the community, renting is also an option. A home with 3 bedrooms will cost approximately $1,654 a month, with the median rental in this community costing over $1,800 a month. For more information on this gorgeous area of Nevada, please contact our office. We will be able to provide you with options to buy or rent a home as well. Our property management team specializes in residential areas throughout Summerlin, NV. We offer multiple services to take your rental property and convert it into reliable income. We have a thorough screening process that helps to identify the right tenants for your property. Our team works hard to keep both parties happy through effective communication, bullet proof lease agreements, and timely monthly rent collection. We offer maintenance services to enhance the property and ensure that it will retain or increase in value. We oversee everything, allowing you to sit back and relax and know that your property and your tenants are in good hands. Contact us today if you are ready to receive a comprehensive analysis of your rental property and to inquire about our Summerlin area property management services.